“I’m not afraid of death, I just don’t want to be there when it happens.” Woody Allen is not the only one of us to avoid facing up to death. Dying is something we rarely talk about – despite the fact that it will happen to us all one day. But some homeless charities are trying to change that. 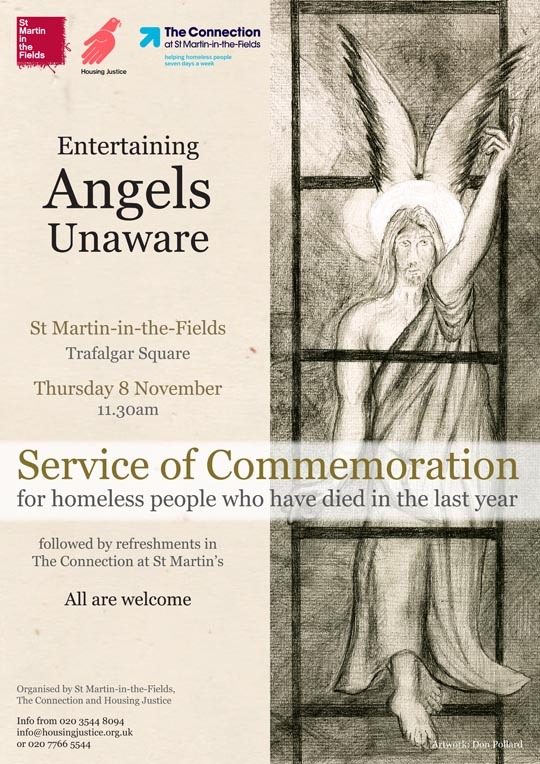 On 5 November, Housing Justice and The Connection at St Martin’s are due to hold their annual service of commemoration for homeless people who have died in the past year. The names of the deceased will be read out in the service at St Martin-in-the-Fields church on Trafalgar Square, alongside hymns, readings and songs. Around 150 names had already been submitted in October. 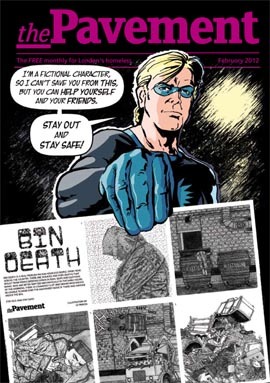 (The Pavement, 30 January 2013) In the last issue, The Pavement introduced exP2A, a new leisure and fitness-focused charity run by former and current homeless service users. We sat down with two of its founders, Alex Ireland and James McPherson, in a cosy nook of the National Portrait Gallery to find out how the charity came about, how it will work and when the service will be up and running. Widely known in the homeless online community by her Twitter identity @aibaihe, exP2A director Ireland has long been a commentator on, and critic of, homeless services. So what’s it like to be on the other side of the fence? “This came up in our first meeting,” she admits. “How would we feel about being on the other side? We realised that it was important that we’re not. exP2A aims to give associates the chance to try new things and gain real skills. “At the moment is a lot of organisations running groups because they attract funding,” says Ireland. “And while a lot of organisations are coming round to the idea of service-user employment, they’re assuming that service users will become drug counsellors or work in hostels, but no more.” She hopes exP2A’s associates will discover activities and employment opportunities outside the homeless ‘bubble’. “You don’t just have to say, ‘Let’s stick them in a flat and that’s it. That’s all they can expect from life’.” The money the team raises through the fitness groups and other activities will go towards helping associates pay for personal training or group activities, be it learning to drive a forklift truck or going scuba diving. The condition is, they must decide together what to do with the money and learn to balance expensive activities with cheaper activities. And exP2A’s empowering slogan, “From Passive to Active”, is not just about career prospects say Ireland. “It’s about showing people that you may be on benefits and if you do get a job, you’re not going to have much spare cash, but there are things you can do for free or you can budget to do some of the things you want – and you can build a community of like-minded people around you.” The exP2A team is starting to build a database of free and cheap things to do in London – from knitting clubs to, well, sitting in the National Portrait Gallery. They’d like to use this information to create an app, where you can enter your budget and discover cheap or free things to do within that. While ex2PA’s on hold, McPherson’s been using the downtime to plan the charity’s marketing strategy. As well as handing out flyers outside Green Park Station and running the @DeskWorkout Twitter account, one plan is to start a controversial poster campaign. “We’re hoping to do that for the universities,” explains McPherson. 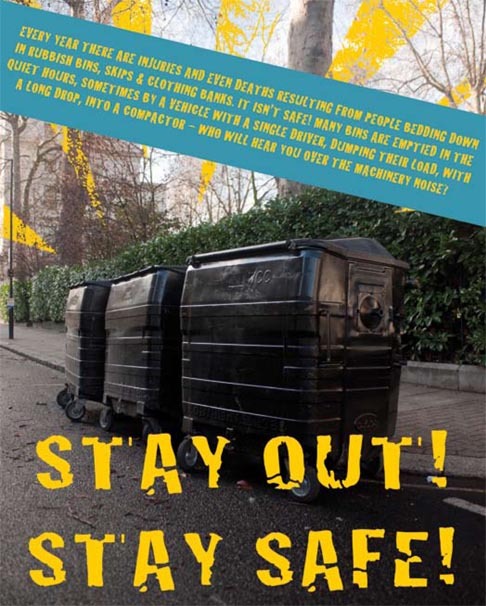 “It’s essentially about challenging stereotypes about homeless people. One of the ideas was possibly using Alex and Brad, our other member of the team. He is a lot more masculine than I am [“he has quite an outwardly aggressive appearance,” interjects Alex with a laugh] and we thought if we had a few pictures of him motivating Alex as part of the fitness group, they could be cropped to look like something completely different.” A web address will direct people to the exp2A website, where they will see the full picture, in more ways than one. The results of and responses to the campaign, like all their planned marketing steps, will be reviewed online. (The Pavement, 15 June 2012) In 2009, a flurry of stories about Japan’s “net café refugees” filled the national media – including The Pavement. But the issue may be closer to home, with reports of homeless people sleeping in London’s 24-hour internet cafés. In December, The Irish Times reported on homeless people sleeping overnight in internet cafés in Dublin. An outreach team described the numbers as “small, but growing and significant”, with two 24-hour internet cafés in Dublin’s city centre pinpointed as being used by homeless people to sleep. One charges €10 per night and even advertises itself in a window poster as being “cheaper than a hostel”. (ARISE magazine, issue 15) After a starring performance in acclaimed film The First Grader, Kenyan actor Oliver Litondo could have lent on Hollywood for his next role. 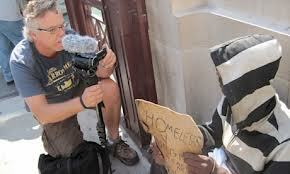 Instead the 63-year-old former journalist chose a part in a short film about homelessness. The Truth About Stanley centres around the eccentric Congolese homeless man of the film’s title (played by Litondo), who forms an unlikely friendship with runaway Sam, regaling the 10 year old with fantastic tales. “What he lacks in material possessions, he makes up for with his vivid imagination and an insatiable desire to tell stories,” explains director and co-writer Lucy Tcherniak. “This storytelling serves as a coping mechanism, a crutch that allows him to deal with the harsh hand life has dealt him.” Produced in association with UK street newspaper The Big Issue and homeless hostel Anchor House, the film was shot over five days in London and premieres at London arts hub Rich Mix on April 2. (The Pavement, 11 February 2012) The outdated and overused statistic that “the life expectancy of someone who sleeps rough is 42 years” has finally been updated. The original figure came from Crisis’ 1996 report Still Dying For A Home (which we reported on in May 2010). The new report from Sheffield University, also commissioned by Crisis, ups this figure to 47. But this doesn’t mean 46-year-old Pavement readers should start worrying. What the 1996 and 2011 Crisis reports calculate is not how long homeless people can expect to live, but their average age of death. In comparison to the average age of death in the so-called general population (77) it’s a shocking, headline-grabbing figure – even though the reason the figure is so low is that more homeless people die at a young age, dragging down the overall average. However, while being homeless can exacerbate existing health problems or even cause them, not having a home was not found to be the main cause of death among those counted. Instead, the study found homeless people are over nine times more likely to commit suicide than the general population, three times as likely to die as a result of a traffic accident, twice as likely to die of an infection and three times more likely to suffer from a fatal fall. Most significantly, however, it calculated that drug and alcohol abuse account for just over a third of all deaths – a huge proportion. But drug and alcohol abuse of course also affects (and kills) members of the general population too. And as Jeremy Swain, CEO of Thames Link, commented on Twitter soon after the release of the report briefing on 21 December: “we know from robust academic research that alcohol and drug misuse nearly always precedes homelessness”. Despite these obstacles, Dr Thomas went ahead with the report – finding potential homeless deaths by matching postcodes from mortality data provided by the Office for National Statistics with postcodes of homeless day centres and hostel accommodation as provided by Homeless Link. In total 1,731 deaths (where the person was definitely homeless or there is a high probability they were) were counted. Crisis has used the new report’s findings to outline a set of recommendations to improve homeless people’s health, in short: prioritise the needs of homeless people in the restructure of the NHS, reform health service delivery for homeless people and ensure provision meets needs and is integrated and holistic. The next phase of the project, to be published in summer 2012, will investigate cause of death by age and analyse more detailed causes of death – plus, it is hoped, mortality by different accommodation type and area.